The Book Rat: Excerpt & Giveaway: Redeemed by P.C. & Kristin Cast! Excerpt & Giveaway: Redeemed by P.C. & Kristin Cast! A few years ago, the House of Night series swept it's way right through my circle of friends. We read the first book, Marked, in our book club, and it seemed that many of the meetings that followed somehow ended with conversations about where everyone was in the storyline, or some thing that had happened that those who were still reading the series just needed to talk about! With the series ending, I don't imagine those conversations will last too much longer (except for when noobs join the club, and have the series pressed into their hands...); I know there are a number of you out there who are big fans of the series, too, so I'm happy to share an excerpt of the final book with you today, as well as a chance to win a little something from the HON world! 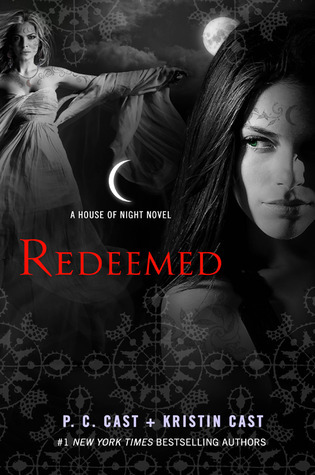 Click through to read a little bit from Redeemed, and then enter to win! To celebrate the release of the final (!) House of Night novel, I have one signed copy of a HON comic! (Kinda perfect timing, after graphic novel week, eh?) I love seeing how novels are adapted to comics, and this storyline, with it's appearing tattoos and what not, seems kinda perfect for that visual approach. To enter, fill out the Rafflecopter below. US only, ends 10/27/14 at midnight. Good luck! On Difficult Decisions . . .